Impatiens walleriana is a shade garden favorite for consistent color all summer…unless they contract downy mildew, a pathogen that can decimate your plants in relatively short order. We first encountered this scourge in 2012 and felt helpless as it ravaged gardens throughout the north. Similar conditions here in 2017 – cool, wet weather – have allowed this disease to rear its ugly head once again. 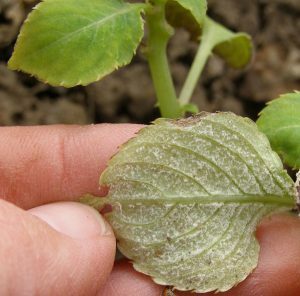 Downy Mildew is type of fungus whose spores can survive in the soil for 8-10 years potentially re-infecting future plantings. The disease also produces sporangia on impatiens’ lower leaves which can be splashed short distances to spread or become airborne and travel long distances. 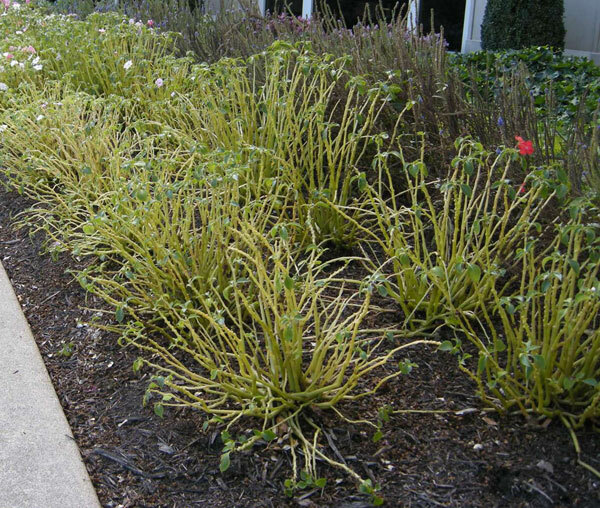 Initial symptoms are yellowing of the impatiens’ lower leaves followed by their progressive loss. The underside of infected leaves will be dusted with what looks like white flour, these are the sporangia. Credit: UMN Extension – Sporulation of impatiens downy mildew. As the pathogen progresses, growth will cease, leaves and flowers will fall off leaving bare, leafless green stems as seen above. If you determine your impatiens are infected, you need to bag and remove the plants, any fallen leaves, blossoms and the closest neighbors. Remove the entire plant including roots and dispose of in the trash. Do not compost infected plant material. Fungicides will not cure an infected plant and it is better to remove the plant to reduce spread of the pathogen to other impatiens in the area. At the end of the season completely remove all plant material to prevent overwintering of the pathogen. Following infection, you will need to plant alternate varieties in subsequent years to prevent recurrence. We’ll be happy to help you find something that will work!